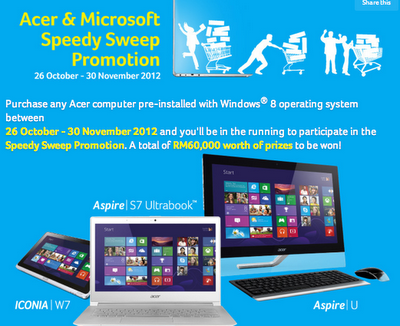 Purchase any Acer computer pre-installed with Windows 8 operating system between 26 Oct - 30 Nov 2012, will stand a chance to play "Acer & Microsoft Speedy Sweep Promotion" on 12 Dec 2012. Attach the purchase receipt / invoice & hand over to a drop-in box available at the selected PC Expo II locations. or Submit your entry via Acer Malaysia's Facebook by uploading the purchase receipt / invoice along with the required contact details. Visit Acer Malaysia Facebook fan page for more details. Win a share of RM25,000 worth of prizes by just playing Style Your Veo game.